How easy it is to fall beside the line where dreams and visions become nightmares and in those fragile viewings what is left of humanity or is introspection the only result? Who can guide us in understanding what we now see? Scratch past the surface and what is revealed? Drops of blood speak of history and the sorrow of today. Can these states of ‘being’ remain, in light of even the smallest of changes or is a new and altered state, simply inevitable? Following the longest hiatus of exploration of the soul, of mankind’s origin, the reflection of haunting becomes clearer. But where are we in relation to the deepest part of the forest? Is it enough to be aware or will a conscious awakening arise from unconscious slumbers? It is through the voices of Shamans that the earth has always responded in visions. The heartbeat of magical reality finds its place and through senses ceases in questioning time and wakes to its existence. It is through such reconciliation that each human is able to reconnect every living breath to another. The erstwhile loss of ‘humanity’ attempts to return to the central psyche. Mantra guided, stepping beneath the curtain of Ayahuasca leads not only to responsibility but creates the space affording a balance to life. Timeworn concoctions of ancient knowledge open the door not only to blood, water, earth and air becoming visceral but to the gentle harmony in which to heal both self and nature. Dressed in white, a solitary man sits at the table, his apparel in stark contrast to the greens on a plate in front of him, red wine at the ready and the shine of silver cutlery. A Shamanic Crown sits upon his head and his face is obscured by flowers. The bottle of olive oil and lemon upon the table infers anointing but of what? The greens? The crown? Or perhaps the flowers covering his face? A shamanic mantra begins to resonate but he remains motionless. In the vibrations of the singing, each flower is removed and it becomes apparent they have been attached via needles. As they are released from his face quickly and blood begins to flow, flowers fall upon the plate. Does the metaphor carry the cost of what is being eaten or is the sacrifice not only of the beauty of nature but also the bloodletting of man? Taking up the silver cutlery, he eats from the plate, flowers, greens, his own blood. The sound of the shamanic mantra seems to rise and fall, a call out to any who can hear. This horrific vision intensifies in light of the majesty of the crown. Is he modern? Is he ancient? 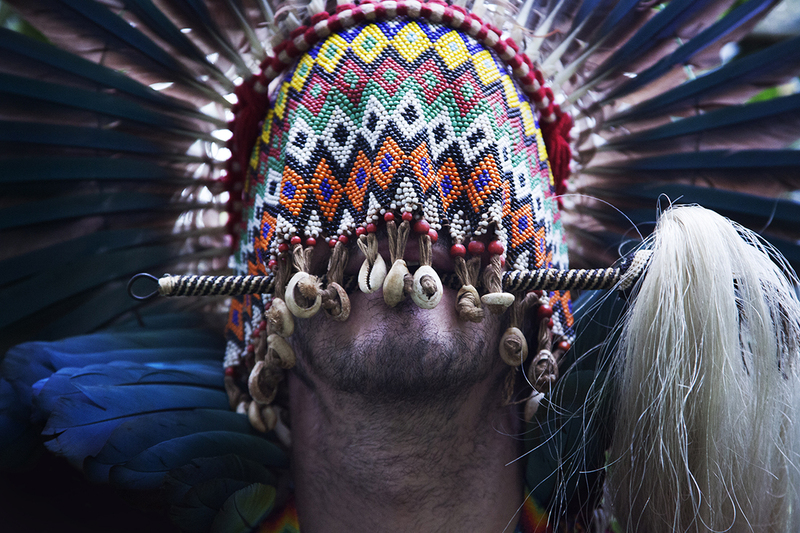 Does he carry the indigenous heart of the Amazon, here at the table? Responsibility sits heavy in an every-day ritual. How does this mixture of images, both sophisticated and primitive communicate what needs to be seen and heard? Does the link between the magical and real bring home the state and capacity of the lungs of the world? Is it the mystical which can cross the huge divide? Is it separate or just an illusion? In the blood, the colour, the purity of attention, the nurturing of body and mind is not just the territory of sophistication. As the blood flows from body to petal, a question arises. A challenge to all to understand the power of all humans and nature, its origins and its necessity to feed and nurture.